Note: #41-24604 Yardbird was extensively damaged on mission #11 on 23-January 1943 and became a "Hangar Queen" undergoing repairs. After repairs were completed one additional mission was flown on 29 May 1943 (Mission 40), 1Lt Joseph E. Trojan, Pilot, to St. Nazaire, France. Was shot down by flak and German fighters and crashed near Pleubian, France. #42-5260 Yardbird II was ditched in the North Sea on 2 October 1944 (mission 73) on her 43rd combat mission. Capt John W. Farrar (P)(WIA) - 25 credited combat missions flown. Three missions flown as a Lead Crew CoPilot: With Maj Richard D. Callaway - Mission 9; With Capt Lewis E. Lyle (Missions 31, 36). All other missions flown as First Pilot. Was slightly wounded on 1 May 1943 by anti-aircraft fire (Mission 32). Completed 25 mission combat tour on 15 May 1943 (Mission 36). 1Lt Joseph E. Trojan (CP)(POW) - 21 dispatched (19 credited) missions flown: 13 credited missions with Capt Farrar (2, 9, 10, 11, 17, 18, 20, 21, 23, 25, 27, 28, 35 - mission #2 as a Photographer. 2 missions with other Pilots - Lt David S. Clifton (29) and Lt Joseph F. Palmer (31). Upgraded from CoPilot to Pilot on orders dated 22 March 1943. Flew on 4 dispatched (2 credited) missions as First Pilot (33 (Aborted), 37, 39 (Aborted), 40). Became a POW on 29 May 1944 (Mission 40) in B-17F 41-24602 Yardbird (360BS) PU-A - First and last mission of Yardbird since being damaged on mission 11 on 13 January 1943 and being replaced by B-17F 42-5260 Yardbird II. 1Lt Rictor H. Auman (N)(WIA) - 26 dispatched (25 credited) missions flown: 25 credited missions with Capt Farrar (All of Capt Farrar missions); One dispatched missions with 1Lt Joseph E. Trojan (33 - aborted). Was slightly wounded on 1 May 1943 by anti-aircraft fire. Completed 25 mission combat tour on 15 May 1943 (Mission 36). 1Lt Jack W. Stewart (B)(POW) - 23 dispatched (21 credited) missions flown: 17 credited missions with Capt Farrar (1, 2, 7, 8, 9, 10, 11, 15, 16, 17, 18, 20, 21, 22, 23, 30, 32); 6 dispatched (4 credited) with other Pilots: 1Lt David W. Mack (31); Capt Jacob W. Fredericks - As Passenger (38); 1Lt Joseph E. Trojan (33 - aborted), 37, 39 - aborted and 40. Became a POW on 29 May 1943 (Mission 40). T/Sgt Kenneth C. Hassler (E) - 26 dispatched (25 credited) missions flown: 24 credited missions with Capt Farrar (All Farrar missions except mission 28); 2 dispatched (1 credited) mission with 1Lt Joseph H. Trojan (33 - aborted and 37). Completed 25 mission combat tour on 17 May 1943 (Mission 37). T/Sgt Erik K. Lindewall (R) - 26 dispatched (25 credited) missions flown: 25 credited missions with Capt Farrar (All of Capt Farrar credited missions); 1 dispatched mission with 1Lt Joseph H. Trojan (33- aborted). Completed 25 mission combat tour on 15 May 1943 (Mission 36). Sgt George N. Dillard (BTG)(EVD/POW) - 3 credited combat missions flown: 2 with Capt Farrar (1, 2); 1 with 1Lt Paul F. Flickenger (6). Shot down on 12 December 1942 (Mission 6) and attempted to evade capture. Was captured by the German Gestapo at the Dijon, France railroad station on Christmas Day 1942 and became a POW. S/Sgt Paul H. Prescott (WG)(WIA/POW/DOW). 24 dispatched (23 credited) flown: 21 with Capt Farrar (All Farrar missions except 2, 8, 16, 31); 3 dispatched (2 credited) missions with 1Lt Joseph H. Trojan ( 37, 39 - aborted and 40). Became a POW on 29 May 1943 (Mission 40) and died of his wounds on 4 June 1943 while a POW in a German hospital at Paris-Clichy. Is buried in the Epinal American Cemetery near Vosges, France. S/Sgt Kenneth J. "Joe" Kurtenbach (TG)(EVD/POW) - 3 credited combat missions flown:: 2 with Capt Farrar (1, 2); 1 with 1Lt Paul F. Flickenger (6).Shot down on 12 December 1944 (Mission 6) and attempted to evade capture. Was captured by the German Gestapo at the Dijon, France railroad station on Christmas Day 1942 and became a POW. Became the "Man of Confidence" (Enlisted camp leader) at Stalag 7-A at Moosburg, Bavaria and 17-B at Krems, Austria. He was awarded the Legion of Merit Medal after his release as a POW for his very valuable counseling to newly arrived prison camp POWs. Second Waist Gunner - The Capt Farrar crew had no original second Waist Gunner and utilized substitute Waist Gunner crewmen on their missions. S/Sgt Joseph R. Sunderlin (BTG)(POW) - 24 credited combat missions flown: 21 with Capt Farrar - As BTG (7, 9, 10, 11, 15, 16, 17, 18, 20, 21, 22, 23, 24, 25, 26, 27, 30, 31, 32, 35, 36); 5 Dispatched (3 credited) missions with other pilots - 1Lt Paul F. Flickenger (2), 1Lt Joseph E. Trojan 33 (Aborted) 37, 39 (Aborted) and 40). 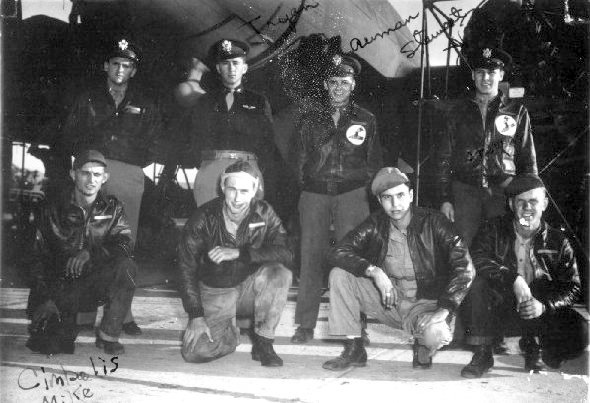 POW on 29 May 1943 (Mission 40). S/Sgt Lincoln T. O'Connell (TG/WG)(POW) - 23 credited missions flown: 18 with Capt Farrar - As Tail Gunner (9, 10, 15, 31, 32), As Waist Gunner (16, 17, 18, 20, 21, 22, 23, 26, 27, 28, 30, 35, 36); 5 Dispatched (3 credited) missions with other Pilots - 1Lt Paul F. Flickenger (2), 1Lt Joseph E. Trojan (33 - aborted, 37, 39 - aborted and 40). POW on 29 May 1943 (Mission 40). S/Sgt Frank W. Bartlett (TG/WG)(WIA/POW/REPR) - 24 credited missions flown: 21 with Capt Farrar - As Tail Gunner (7, 11, 16, 17, 18, 20, 21, 22, 23, 24, 25, 26, 27, 35, 36), As Waist Gunner (2, 8, 9, 10, 15, 32); 5 dispatched (3 credited) missions with other Pilots. Capt Lewis E. Lyle (13), 1Lt Joseph E. Trojan (33 - aborted, 37, 39 - aborted and 40). Was seriously wounded on mission 40. POW on 29 May 1943 (Mission 40) and repatriated in 1944 due to his wounds.